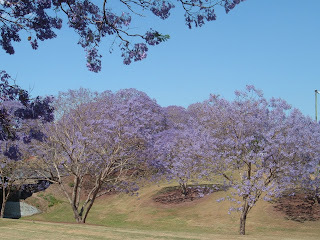 Springtime here means the Jacaranda trees are once again in bloom. 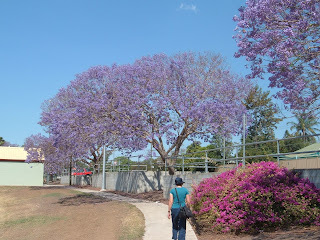 As Inge says they are like "bluebells blooming on trees"
We went to a park in Goodna, about 15km from us to have a walk around the park. 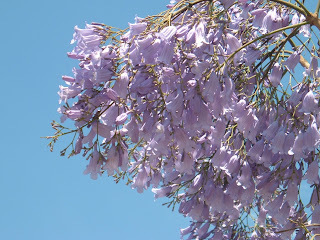 The trees in bloom against a blue sky make a visually spectacular impression. 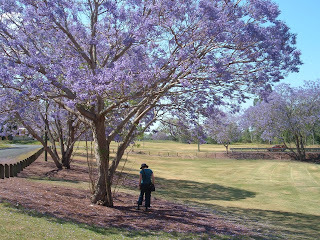 We just dont get bored of looking at these trees. It is a nice feeling to look and admire these beautiful trees. 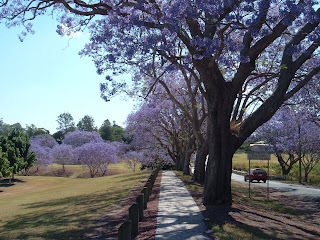 The trees originate from Brazil but can be seen around the world in sub-tropical countries, I remember them as a child in Africa. O, i just love them as well!! Haven't seen them in full glorie yet, only on pictures. Canungra Classic HG Comp - watching only..